Is train carriage capacity information coming to Sydney? Transport for a London has recently begun a trial of carriage passenger utilisation at one station on the London Overground. The idea being that if passengers at the station know which carriages are crowded and which aren’t, they will opt to enter the carriages with fewer spaces. The more even distribution of passengers would then reduce dwell times at stations, improving on time running and journey times. Train enthusiast Geoff Marshall tried it out in the video at the top of this post and Diamond Geezer explains some technical background as to how the system works here. The results of the trial were mixed, but it raises the question of whether such a system would be possible in Sydney. It is understood that all Waratah trains, which comprise about half of the Sydney Trains fleet, have weight sensors similar to those used in the London Overground trial. This means it would be technically feasible. 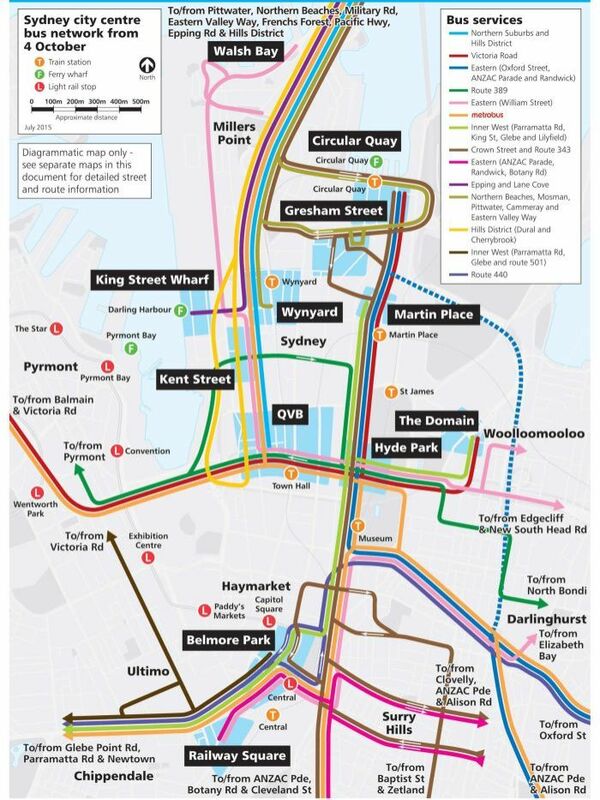 However, when asked about it in 2014 while state’s Transport Minister, NSW Premier Gladys Berejiklian replied that it was not something the government was planning. She did mention that Opal data could be used to achieve a similar result. The same year, Sydney Trains CEO Howard Collins echoed that view; but suggested that train carriage weight, rather than Opal data, could provide passengers with information on which carriages have more available space. To the Government’s credit, Sydney’s real time transport apps now do provide information on how crowded each bus is, allowing passengers to opt for a less crowded bus. The difficulties encountered by the London trial suggest that providing this information may not be worth the benefits. For example, it uses a combination of expected loading based on historical data to estimate how full each carriage will be. That is because the weight sensors will not be accurate until the train leaves the station prior to the one where passengers are. This could give passengers as little as 2 minutes to move to the ideal spot along the platform, which in the case of an 8 carriage train is 160m. So if the estimate is not accurate and passengers aren’t checking for updated information, it could be of limited benefit to its users. Despite the risks, Sydney Trains and the NSW Government should pay attention to the London Overground trial. The potential to squeeze a little more juice out of a network that is straining under no new CBD capacity until 2024 is well worth investigation. Lachlan Drummond visited the Transport Heritage Expo on Monday 13 June 2016, the final day of the 3 day event. Below is his account of the event, which he wrote shortly after the event and would have been posted a week ago had this blog’s regular author not allowed it to sit idly during that time. On the Monday public holiday, my partner and I decided to go down to the Transport Heritage Expo. I had been meaning to go for a few years but something had always crept up. The Transport Heritage Expo is a collaboration between Transport Heritage NSW, Transport for NSW, and a number of other NSW transport heritage organisations who are involved in operating and restoring old transport. It has been running for a few years now at Central Station over the June long weekend. Central station allocates four platforms on the main concourse to display vintage steam, electric and diesel trains and carriages and to run vintage train rides on the actual Sydney trains network. The event begins on the Saturday with the now traditional Great Train Race, where 3 vintage trains race down the Western Line from central to Strathfield. After this, the trains come back to central and continue to run services on other city rail lines every two hours or so over the long weekend. At the station there are vintage trains and carriages on display that have been lovingly restored and maintained by the various transport heritage organisations. You can book a Devonshire tea cooked inside an original 1950s train carriage, and you can even hop into the driver’s cab of a Waratah train on the platform. There’s also a merch stand, a jazz band, and some vintage buses running outside on the colonnade. The great thing about this expo is you don’t just get to see the trains and buses as a static museum piece. You get to see the trains leave and arrive at a real train station. You get to jump inside the carriages, hop into the drivers cabs and have a look around. And best of all – it’s mostly free. It does cost $25 to ride one of the vintage trains or to have Devonshire tea, but you don’t have to pay anything to climb around them while they’re back at the station. It’s also free to ride the buses. It’s a really great event for train enthusiasts, families and kids in particular. This year the expo showed off a variety of different trains. The big highlight for most people was probably to see a fully operational steam train – engine 3642, hauling vintage carriages down to Hurstville (with an assist from a vintage diesel engine). This train has been beautifully restored, and it was a real joy to see it at the station (unfortunately I didn’t get to ride this one as tickets sold out very quickly). When it pulled into the station you could jump into the drivers cab and have a look around. A variety of organisations also had some lovely diesel engines on display. The blue engine 4001 was a standout – beautifully painted, and sitting on the platform with its engine open so you could see the inner workings. The guys at 3801 Limited also showed of their excellent restoration job on an old lounge and sleeper car, including the sitting area and bunk cabins. They are looking for some financial assistance to restore the toilet to full working order – if you want to give them a hand you can visit their website. Diesel engine 42101 also looked great. Sydney Trains also came to the party with a very new Waratah set sitting at the station with the driver cab open. Kids young and old got to sit in the front seat and were shown by a driver how it works. For me, the train that really stole the show was the recently restored “F1” red rattler electric train, returning to heritage service for the first time in 15 years. We hopped on the 9:30AM Monday service to East Hills and back. A collection of 4 carriages built in the 1920s in Clyde and Newcastle, the set features three driver cabins and one passenger cabin, which we travelled in. Amazingly, one of the driver cabins (C3426) was part of the first scheduled service across the Sydney Harbour Bridge in 1932. Some of the carriages saw some renovation work in the 1980s as they were kept in service until 1992 due to the delay of the Tangara trains. After this, Sydney Trains grabbed them and restored them for heritage services in about 1999, but they hadn’t been seen since 2002. These carriages and interiors were in fantastic condition, with the seats containing the old NSWGR logo on them and the windows and (manual!) doors were fully functioning. An old 1970s network map was still on the wall above my head, featuring stations such as “Goodyear” (Goodyear tires) and “Hardies” (James Hardie) on a spur line near Clyde. An interesting insight into Sydney’s industrial past. Best of all, this train is in fantastic working order and was an absolute joy to ride. We travelled down the Erskinville-Sydenham-Tempe line, slowly through stations due to the width of the train and rebuilt platforms. Once we hit Wolli Creek and the East Hills express line, the driver opened the throttle and we were soon overtaking local Waratah train services at what must have been close to 70kph. It was seriously impressive stuff. At East Hills we got out to admire the train before we turned around and went back to central. Plenty of the heritage guys were on the train and were happy to answer questions. The restoration work on this set is absolutely top notch and full credit must go to Transport Heritage, Heritage Express, Sydney Trains, Howard Collins, and everyone else who worked on it and helped get it back on the rails. Have a ride on this if you get the chance- it’s a real gem. The guys from the Sydney Bus Museum are currently going through renovations (and will be reopening in August). This didn’t stop them from bringing out a collection of four vintage double decker buses for some joyrides through the Sydney CBD. Their collection included two sky blue Sydney double deckers, a Green one, in fantastic condition. They also had something pretty special – a genuine Leyland London Routemaster from the 1960s, complete with the great old red colours. By chance we were lucky enough to get on it, and we drove up Pitt street up to Park street, and then around Hyde park and back. These rides were free and very popular, although I did chuck 5 bucks in their donation box (and I hope others did too). It was great to see the city from another angle. Last year the Transport Heritage Expo won first prize in the NSW Heritage awards, and it’s not hard to see why. This really is a great day out for everyone, whether you’re a kid, a train enthusiast, or just an older person wanting a bit of nostalgia. While there’s plenty of great stuff to do for free, I really recommend spending the 25 bucks (adult) to ride on one of the old heritage trains. It’s not often that you get the chance to get on a vintage train at central and go somewhere far away on the network. You know the money will be used to keep these great machines running. This expo is a credit to all the transport heritage organisations who put aside their differences for a weekend to create something really special. It’s an example of what can be achieved when everyone works together. I can see it growing into the future – hopefully in a few years we could get some vintage Sydney trams running through the CBD when the new line is built. How awesome would that be? At around 6AM on Sunday morning of 4 October 2015, the last bus on George Street pulled up at Circular Quay Town Hall. The N50 from Liverpool had 3 passengers (EDIT: Tony in the comments section states that the actual last bus was a late running N70). This blog’s author set out last night in an attempt to catch the last bus on George Street, but without knowing which bus it was going to be. Below is a summary of the events of that night. In the end, the thrill of the chase did not end in glory. On the 374 to the city to try catch the #LastBus on #GeorgeSt. Only one problem: I don't know which bus it is or when it is. Wish me luck! 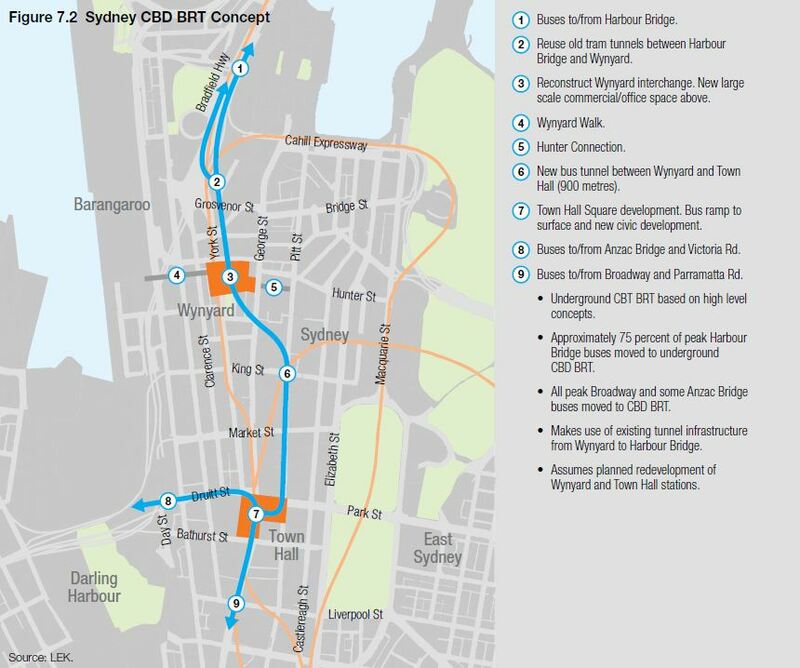 This week sees a large number of changes to the Sydney CBD. Though it ended the week with the most significant: the closure of George Street to buses, it began the week with some changes too: the opening and closing of bike paths through the CBD. New bus lanes have been added on Elizabeth Street while another bus lane is soon coming to College Street. Construction of the CBD and South East Light Rail will commence on George Street on 23 October, at which point the road will become progressively closed off to all vehicular traffic. It will eventually re-open as a pedestrian only street, with trams on George Street taking passengers from early 2019. In anticipation of this closure, buses are being removed from George Street as of 4 October. 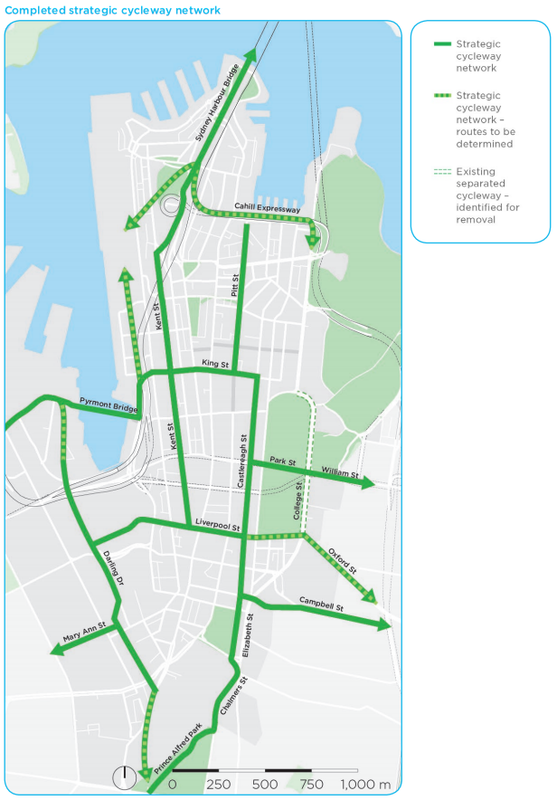 Some will terminate outside of the CBD or on its fringe (including some buses that do not use George Street), while others will be moved to Elizabeth street or are merged with other buses so that they will now through-route in the CBD and come out the other end. 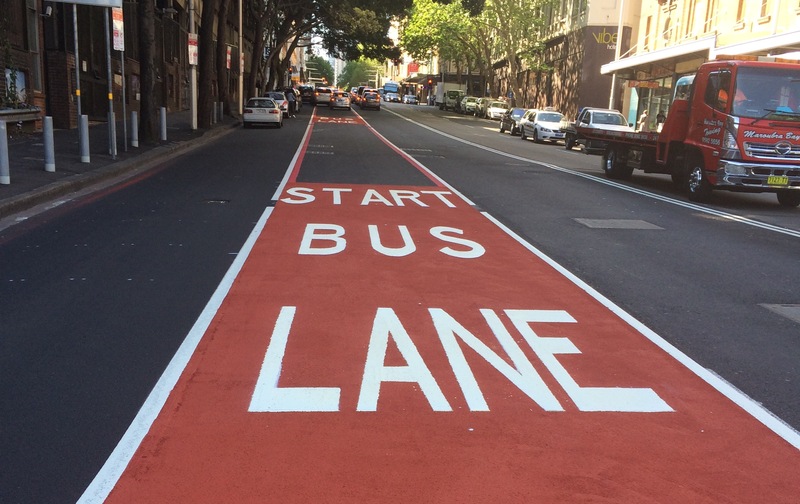 In order to accommodate the additional buses using Elizabeth Street, the bus lanes on it have been moved from kerbside bus lanes to centre bus lanes. This will prevent buses from getting stuck behind other buses waiting at bus stops or getting stuck behind cars waiting to make a left hand turn. These had previously slowed down buses that would otherwise enjoy an exclusive right of way. The College Street bike path is no more. It is to be replaced with a bus lane. This will allow additional Northbound bus capacity now that George Street is no longer available. Additional Southbound bus capacity exists on the Castlereagh Street bus lane, while Elizabeth Street has two way bus lanes. 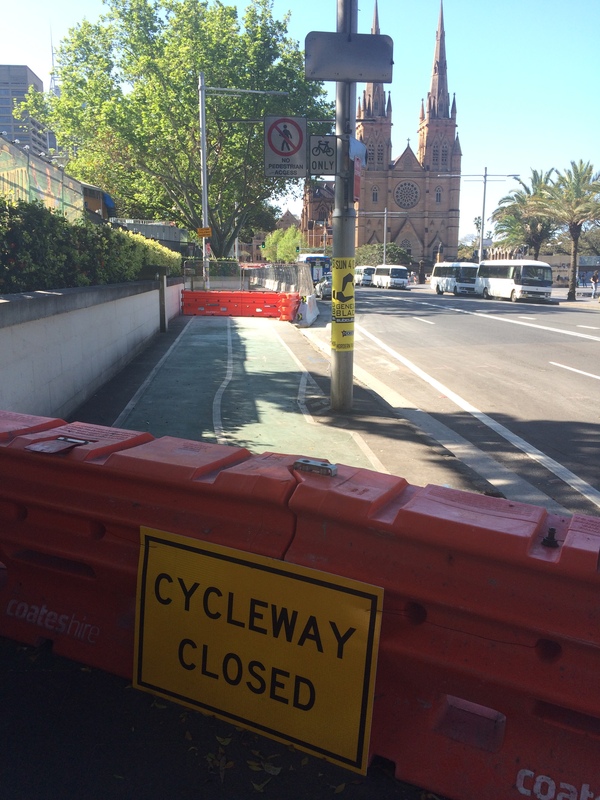 The bike path on College Street remained open until the Castlereagh Street and Liverpool Street bike paths opened, which now provide North-South access through the CBD. Cyclist groups have protested the removal of the College Street bike path, pointing out that the Castlereagh Street bike path stops at Liverpool Street, which is the same place the College Street bike path starts; also pointing out that the York Street bike path is on opposite side of the CBD to the College Street bike path. Plans are in place to extend the Castlereagh Street bike path further north; but these plans have been put on hold until 2019, after construction on the light rail has been completed. New bike paths opened on Castlereagh and Liverpool Streets, replacing the College Street bike path. Together with Belmore Park near Central Station and the York Street bike path on the Northern half of the CBD, these now allow bike users to ride from Central Station to the Harbour Bridge entirely segregated from road traffic. The full CBD bike path network will include an extension of the Castlereagh Street bike path to King Street, which would also see its existing bike path extended from where it currently ends at Clarence Street. 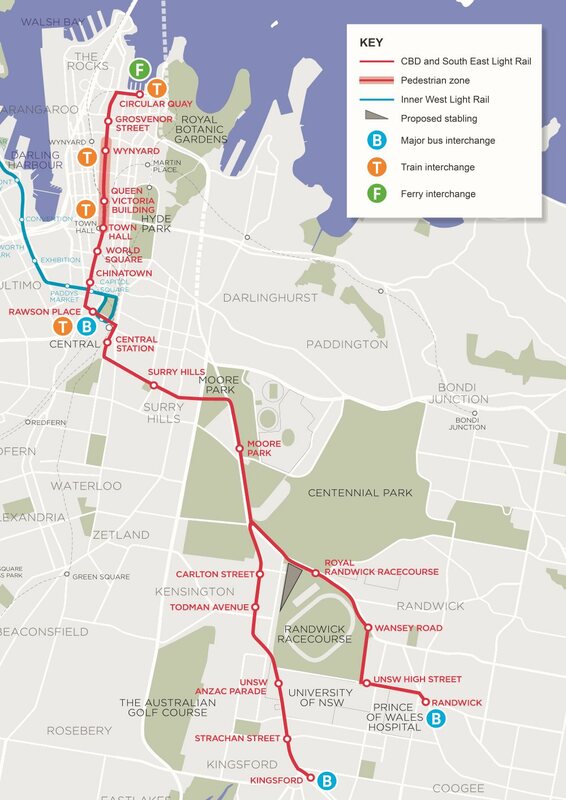 However, work on this portion of the bike path network, as well as other extensions such as a bike path North along Pitt Street to Circular Quay or a bike path West along Liverpool Street to Darling Harbour, has been put on hold until 2019 to minimise disruptions while construction on the light rail on George Street occurs. There have also been concerns raised about potential plans for loading zones on these bike paths, turning them into what has been called “part time” bike paths. The new bike paths have also drawn criticism for ending one block short of two way traffic on Liverpool Street, requiring East bound bike riders on Liverpool Street to dismount or take alternative routes along Bathurst or Campbell Streets.